Denim is a staple for any season, but this season it's all about the wide leg. The bell bottom is back everyone, so dig through your closet for those pairs that you never thought you would wear again. 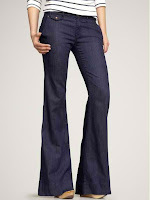 I'm loving the trouser look seen below which is a great option for work. I also love Emily's style from Cupcakes and Cashmere this week. These wide leg trouser jeans from Gap are the perfect wash and cut for the office or the weekend. 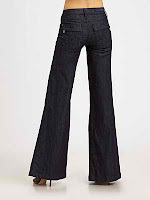 Rock & Republic is rocking a great pair of bell bottoms with back pockets.